The popularity of online video slots has increased tremendously in the past decade and there is a good reason why – video slots offer players more winning opportunities since they boast multiple paylines, which equals more winning combinations. Gone are the days when players were faced with the option to engage only in 3-reel slots where usually one payline is available. The immense popularity video slots enjoy among online casino players results from the convenience they offer. One is simply required to fund their online casino account via one of the many reliable payment methods available and choose their preferred video slot. If you have played video slots at a brick-and-mortar venue, you are unlikely to experience difficulties adapting to their web-based cousins. If not, read on to find out more about how online video slots are played, what their payouts and special features are, and which titles enjoy the greatest popularity among slot fans. Even if you are new to slots and lack previous experience, you will quickly find video slots are among the easiest games to play at web-based casinos. Of course, the first thing you need to do is open a real-money account at an established web-based casino and fund it. Then you can proceed by loading your preferred video slot and adjusting the size of your wagers. Since there are multiple paylines in online video slots, players need to first select their coin value. The denominations usually differ from one slot title to another but the minimum coin value typically amounts to £0.01, which renders video slots suitable for players on a budget. The maximum coin value rarely exceeds £5.00. Once you have selected the value of the coins, you need to decide how many coins you wish to bet per active payline. As was mentioned earlier, there are multiple paylines and sometimes, players get to choose which lines to activate. However, there are video slots with “fixed” paylines meaning that you cannot deactivate any of them but will be required to place wagers on all lines. You can choose how many coins to bet per line in the Level menu. For example, if you select a coin value of £0.02 and choose to bet two coins per line on a slot like NetEnt’s EggOMatic which has twenty paylines, the total amount you will wager per spin will be equal to £0.80. 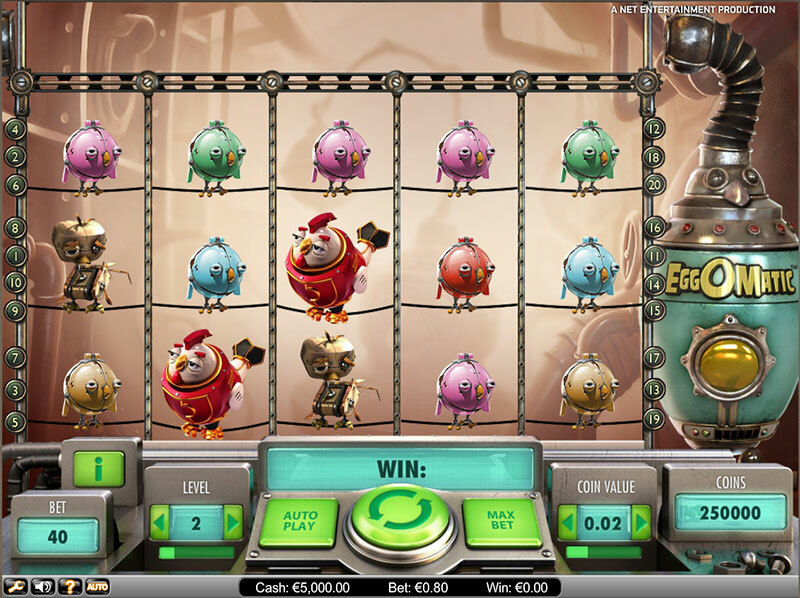 NetEnt’s EggOMatic slot with 20 paylines and coin value of £0,02 on level 2. Each spin of the reel will cost the Player the sum of £0,80. When you adjust the coin value and the number of coins per line, all you need to do is click on the Spin button and keep your fingers crossed for a winning combination. Then again, if you are feeling lucky, there is always the option to wager the maximum sum allowed by hitting the Max Bet button. This way, you will bet on all paylines available. If you hit a winning combination, the winnings will be immediately credited to your casino account balance. Placing the maximum bet on all paylines will also increase your chances of unlocking a bonus game, which can potentially boost your profits. NetEnt’s EggOMatic max bet of £200. Placing the maximum bet will increase the chances of unlocking a bonus game. 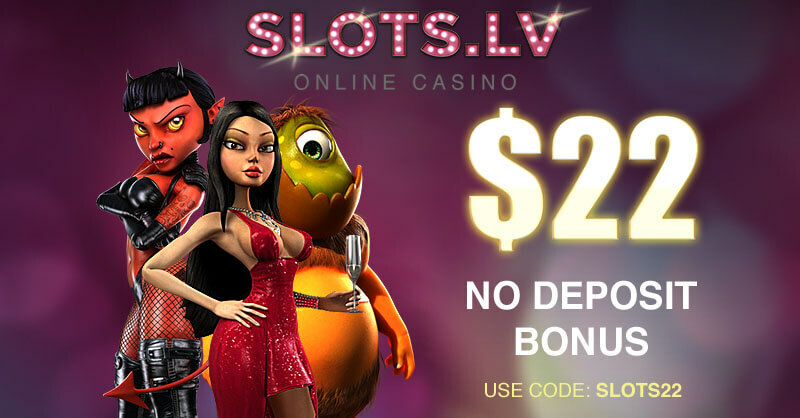 Back in the day, slots used to offer a limited number of features, but today this is no longer the case. 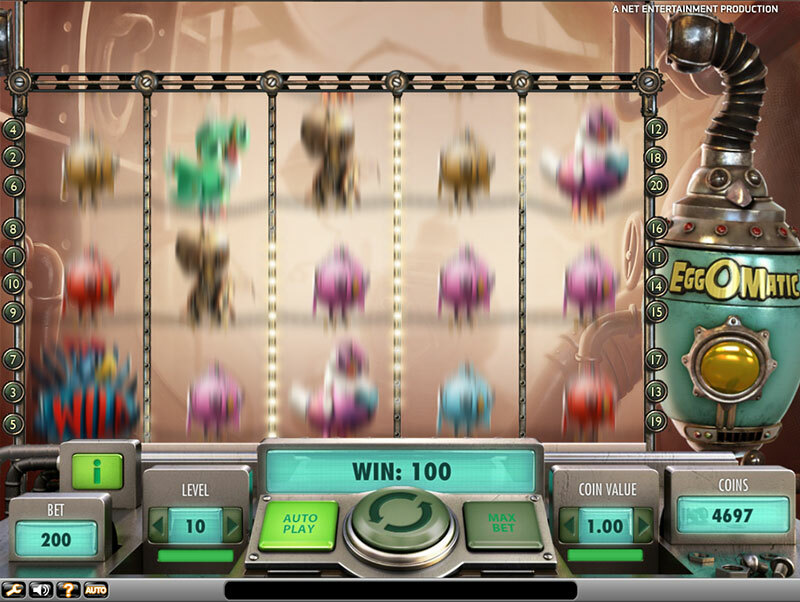 The online video slots come with an impressive number of extras but typically the first thing that players notice is their design. And how can it be otherwise when video slots stand out with superb visuals and animations? The symbols are often animated and come to life whenever the player succeeds in hitting a given winning combination. The great sound effects further increase the games’ entertainment value. But visual appeal is by no means the only benefit of playing video slots from the comfort of your surroundings. Players will be able to benefit from a wide range of special features which aim at making their gaming session even more rewarding. One such feature is the scatter symbol which is indeed special because it does not have to fall within the paylines in order for players to win. Scatter symbols pay out no matter where they land on the reels. On many occasions, scatter symbols are the key to unlocking free spins or other bonus games on the video slot. Wild symbols are another lucrative feature which helps players generate greater profits. As they function as substitutes for all other symbols on the reels, they can help players complete a winning combination. There are many different types of wild symbols including sticky, expanding, stacked and shifting wilds, but these differ greatly, depending on the slot title and the software supplier that has developed the game. The multiplier feature is a favourite among players because it has the capacity to multiply their winnings by a predetermined figure. On many occasions, multipliers double or triple the amount players have won, while in other instances they can increase the winnings a hundred or even a thousand times. Some multipliers are available only in the base game, but there are some which appear during free spins and bonus games. Autoplay is another handy feature you are likely to encounter when playing video slots. When it is activated, you will be able to play a predetermined number of spins automatically. You simply need to select the number of spins you want to play, how many paylines you want to bet on as well as the number of coins (and their value) you wish to bet. Make sure you adjust the settings so that the Autoplay feature gets deactivated after you win or lose a given amount of money. Otherwise, you risk depleting your bankroll. 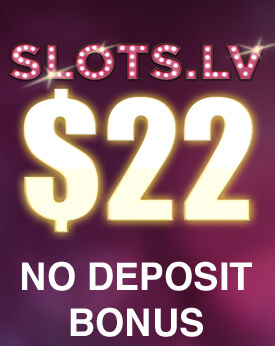 The information concerning bonus features and the payouts for winning combinations is usually displayed in the video slot’s paytable, so make sure you check this out before you play for real money. Many popular video slots have been optimised for the smaller screens of smartphones and tablets. If you register at an online casino that is mobile-responsive, you will be able to enjoy your favourite video slots from the comfort of your surroundings by loading the games directly in your mobile device’s browser. Some of the most reputable web-based casinos offer native mobile applications you can download and install on devices, running on iOS and Android. Superb graphics and engaging animations are hardly the only criteria players should look for when choosing an online video slot to play for real money. The payouts of the slots and their expected Return to Player Percentages (RTP) should also be taken into account. Video slots can be divided into two categories – high-volatility and low-volatility slots. Volatility denotes how often and how much players will win at any given game. Slots with high volatility typically offer more lucrative payouts but players will hit winning combinations less frequently on such games. Slots with lower volatility, on the other hand, offer more frequent, though smaller payouts. Identifying the volatility of a given slot is not simple, but it helps to take a look at the game’s paytable. Generally, the higher the lowest prize on the paytable is, the higher the volatility of the slot in question is. It would also be wise to check what the RTP of your slot of choice is. This information is sometimes available in the slot’s paytable but many reputable and licensed online casinos publish the RTPs of all games on their portfolios at their websites. The term RTP refers to the expected payout percentage or how much of the money players have wagered on a given slot will pay back over time. The RTP also poses as the flipside of the house edge which can be calculated using the expected return percentage. For example, if a given video slot is said to have an RTP of 98.30%, this serves to indicate that out of every £100 players have bet, they can expect to receive £98.30 in winnings. So the house edge for a game with 98.30% RTP would be 1.70%. However, players must not forget that the RTP, no matter how accurate, represents only the theoretical return and is an average of thousands of spins over a prolonged period of time. Also, the percentages might differ a little from one month to another. Nevertheless, it is better to opt for video slots with a higher RTP and a lower house edge if you wish to generate greater profits. Since there are literally hundreds of online video slots to choose from, players who lack previous experience are often overwhelmed by the impressive number of options they are presented with. What is more, each title has its distinct features, paytable and theme. 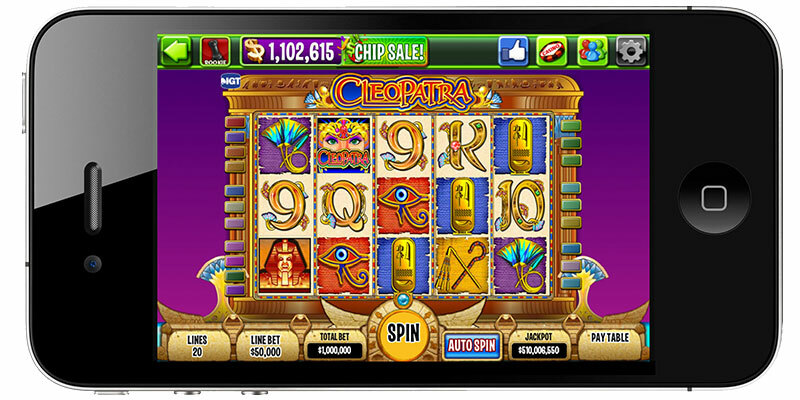 We have narrowed down our list to five video slots which enjoy the greatest popularity among slot fans. Check them out and see which one suits you the most. Microgaming’s Mega Moolah ranks high in terms of popularity among players, who have dubbed it the “millionaire maker”. This nickname suits Mega Moolah perfectly as the video slot even made it into the Guinness Book of Records for the largest payout in an online game ever. On that note, it is worth mentioning that Mega Moolah has a massive progressive jackpot attached to it which keeps increasing incrementally as a small percentage of all bets counts towards the overall pot. However, those who wish to become eligible for the huge payout are required to place the maximum bet available. Players can potentially scoop one of four prizes, the Mini, Minor, Major and Mega jackpots. Mega Moolah is inspired by the African savanna and features various African animals as reel symbols, including monkeys, giraffes, lions, buffalos and elephants. Various high-value cards like Aces and Kings also make an appearance on the reels. 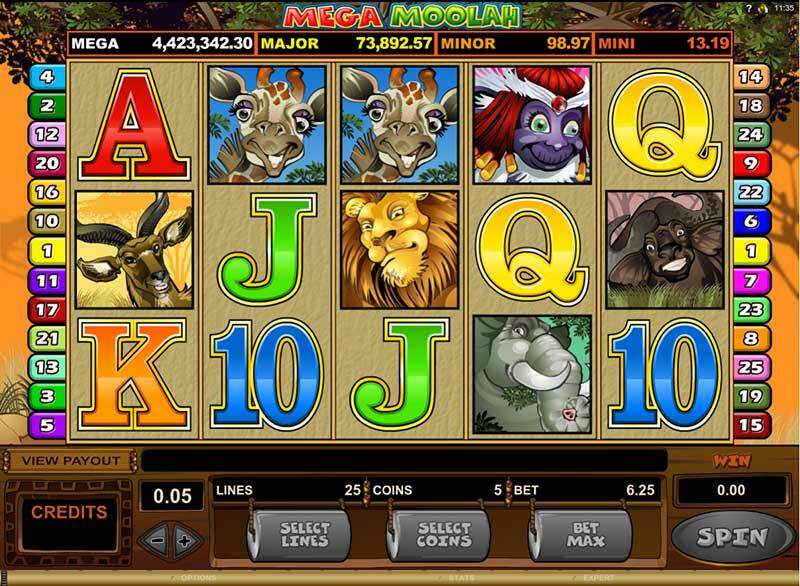 Speaking of reels, Mega Moolah is a five-reel slot with 25 paylines. 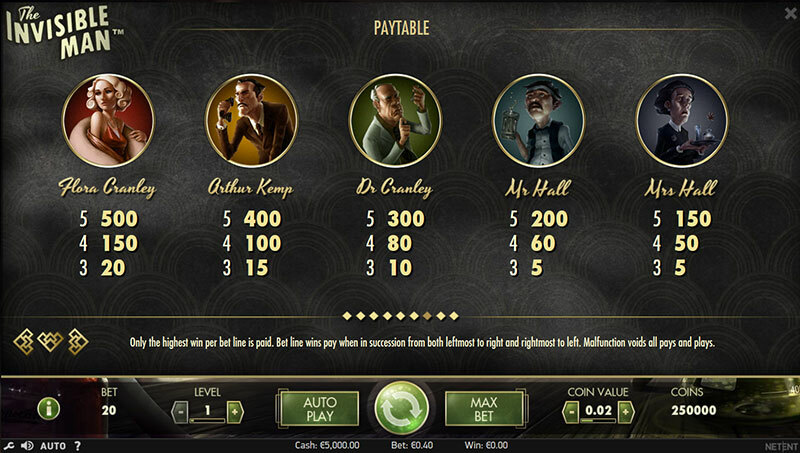 The coin values range between £0.01 and £0.05, while the maximum amount players can wager per spin is 125 coins. The lion symbol functions as a wild in Mega Moolah and those, who are lucky enough to hit five lions on a payline, will collect a prize of 15,000 coins. The lion symbol also serves as a multiplier – it not only completes winning combinations but doubles the profits of the players. Since the monkey symbol is actually a scatter symbol, players who land three monkeys are rewarded with 15 free spins. Starburst is yet another appealing video slot title, courtesy of leading software developer NetEnt. The game impresses with vibrant colours and features various sparkly jewels as symbols. 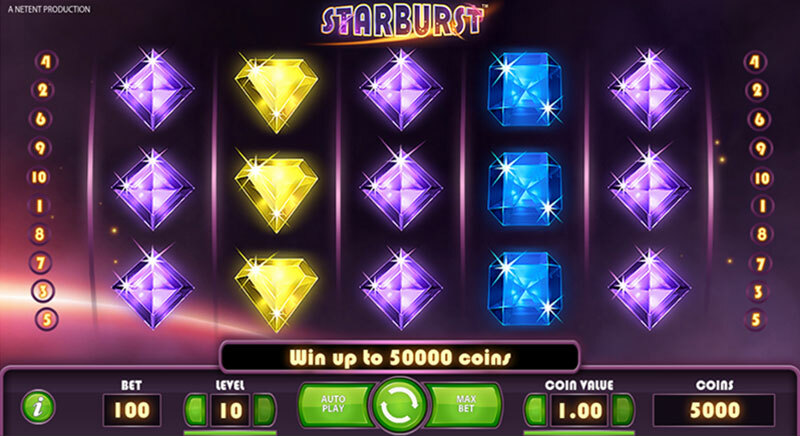 Apart from those, players will also encounter bars and lucky sevens, which happen to be the highest paying symbols in Starburst. The latter is played on five reels and has a total of 10 paylines. What is more, Starburst is available for a mobile play via NetEnt’s mobile platform, allowing players to enjoy it on their iOS and Android devices. Coin values range between £0.01 and £1.00. There are plenty of cool features that will enhance players’ gaming experience and render it more lucrative. These include Win Both Ways, wild symbols, and the Autoplay feature. The Skill Stop feature is also rather handy as it enables players to manually stop the spinning reels with a single click. The game has two bonus rounds. The Starburst Wilds Bonus is activated when the wild symbols land on the middle three reels. Whenever this happens, the wilds expand to cover the reels and players are rewarded with up to 5 free re-spins. The Win Both Ways feature enables players to complete winning combinations from left to right and from right to left. Starburst’s expected RTP stands at 96.10%. 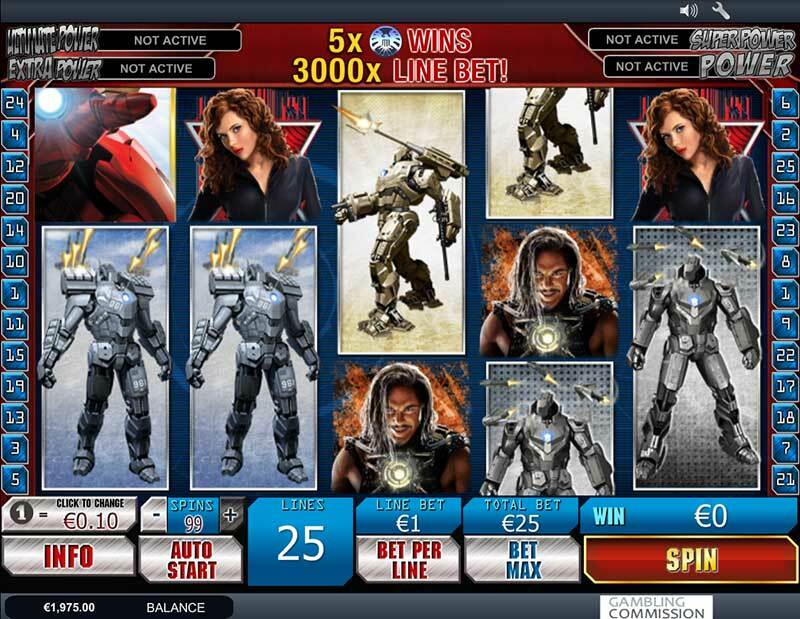 Powered by Playtech, Iron Man 2 is part of the popular Marvel slot series inspired by the well-known comic characters. The game is played on five reels and boasts the staggering number of 50 paylines. The visuals and sound effects in the game are superb, to put it mildly. In fact, this is Playtech’s second version of the Iron Man slot and the software developer has made a few improvements which work to the advantage of the players. For example, you may notice that some of the symbols are bigger and cover two vertical spots on the reels. Needless to say, this can improve players’ chances of hitting a winning combination. The game is packed with handy features, like the eagle symbol which functions as a wild and assists players in completing their winning combinations. The Iron Man logo assumes the role of a scatter symbol and can potentially unlock 10 free spins. The free spins come with a multiplier that increases after every two spins. So, if you hit a winning combination of your last two free spins, your winnings will be multiplied by six. But more importantly, the wild symbol remains on the reels during the free spins, which boosts players’ chances of winning. Like the other Marvel-based slots, Iron Man 2 comes with four progressive jackpots, namely the Power, Extra Power, Super Power and Ultimate Power jackpots. Of course, to become eligible, players should play on all paylines. The coin values for this game range between £0.01 and £1.00, while its theoretical RTP is estimated to be 95.98%. Blood Suckers is yet another enticing video slot, developed by NeEnt, and it truly shows in the quality of the visuals and animations. The game features five reels, while the number of paylines reaches 25. But more importantly, the said paylines are not fixed, which means players get to choose which lines they wish to activate and bet on. The coin values vary between £0.01 and £0.50, with a maximum bet amount of up to £50.00, provided that all paylines are activated. The game is obviously inspired by Gothic stories about vampires as some of the symbols it utilises include male and female vampires, cloves of garlic, crossbows and bibles with silver crosses on top. The creepy sound effects and music further contribute to the dark atmosphere of the game. Winning combinations are accompanied by blood-chilling organ chords. 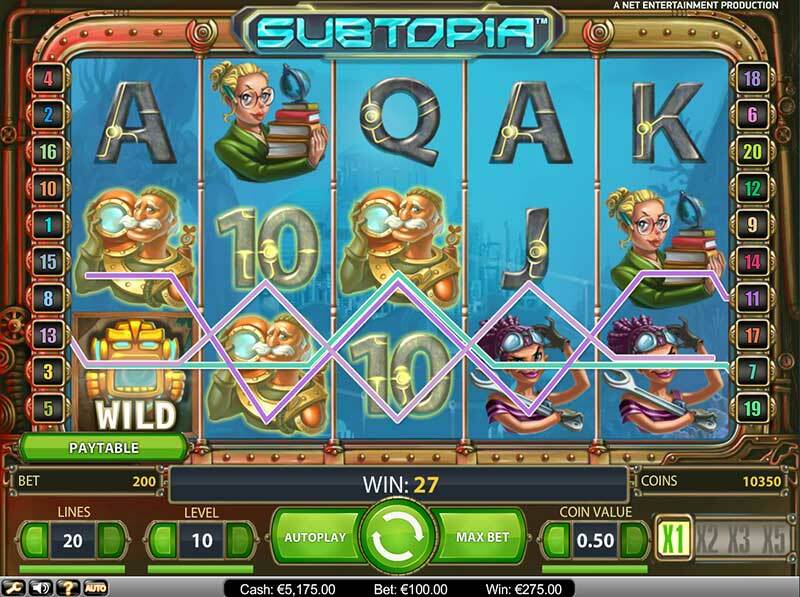 The game is figuratively bursting at its seams with great features which include free spins, scatter and wild symbols. 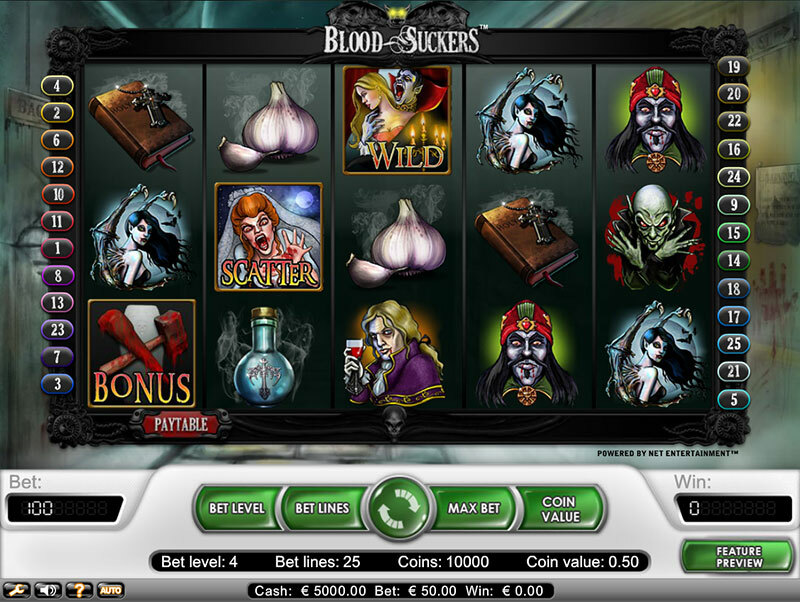 If you get three or more scatter symbols of a vampire bride on the reels, you will be awarded 10 free spins, not to mention your profits will be tripled in free spins mode. The frightful vampire biting into a maiden’s neck functions as a wild symbol that completes winning combinations. Three bloody hammer and stake symbols on the reels will unlock a special bonus game. NetEnt’s Blood Suckers is available for mobile play and has an expected RTP of 98.00%. 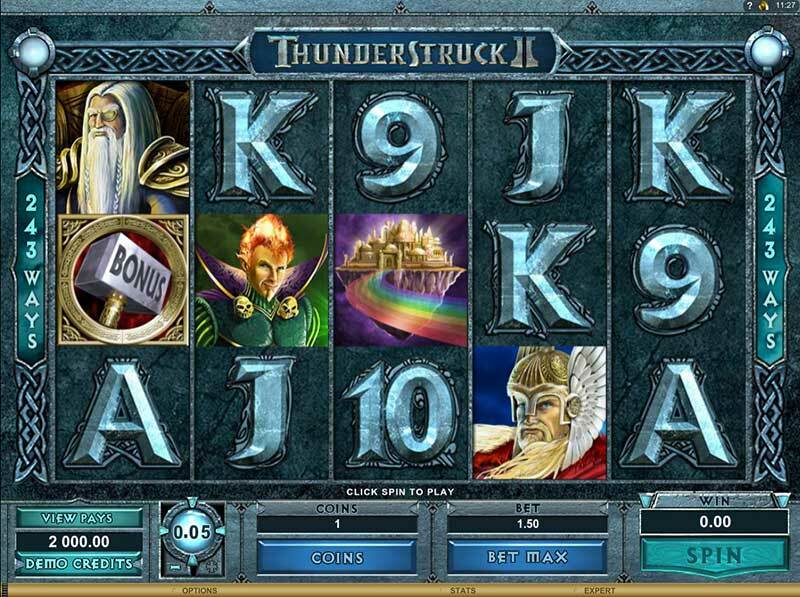 Thunderstruck II is the sequel of one of the most popular video slots available online, namely Microgaming’s Thunderstruck. The sequel features five reels, while the number of winning combinations is truly mind-blowing – there are 243 ways to win in this game. It does not take long to see Thunderstruck II is inspired by Norse mythology as the symbols it features include various Nordic gods like Odin, Thor, Valkyrie, and Loki. Microgaming has introduced one great feature which enables players to keep track of their winnings, namely the Paytable Achievements. The latter are earned by completing all payouts for each of the symbols. Coin denominations in the game vary between £0.01 and £0.05. Thunderstruck II is loaded with special features, including multipliers, wild and scatter symbols. There are four different bonus games, namely Valkyrie, Loki, Odin and Thor’s bonus. During bonus games, players are awarded free spins that range between 10 and 25 in number, depending on which bonus you have unlocked. The RTP for the game is estimated to be 96.65%.